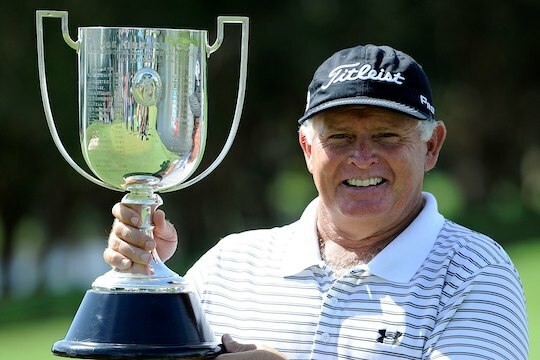 Peter Senior has today claimed his third Australian PGA Championship presented by Coca-Cola title in a thrilling finish at the Hyatt Regency Coolum on Queensland’s Sunshine Coast. Senior triumphed in a two-hole playoff over 2008 Australian PGA Championship winner Geoff Ogilvy who missed a putt on the second playoff hole to hand Senior the win. Playing in the final group Senior chased down clubhouse leader Ogilvy and Andre Stolz who had birdied the 17th to join Ogilvy at the top on 12-under with one hole to play. Faltering under the pressure Stolz drove his tee shot into the water on 18 and bogeyed his final hole of the tournament to finish at 11-under. In what was one of the closest finishes in recent years, a number of other players also missed their chances to join the playoff including Nick O’Hern and Peter Fowler who both missed long birdie putts to finish in equal second position. But for Senior, it was one of his sweetest victories coming an incredible 21 years after his first Australian PGA Championship title. “Age is nothing, Tom Watson proved that when he nearly won the Open and a lot of the older guys have performed well on the main Tour in the US so we are really lucky that we play a long-life sport that we can get a lot of enjoyment out of,” said Senior. With the win Senior becomes the oldest winner of Australia’s oldest professional title. For Ogilvy, who with the second place finish also claimed the 2010 PGA Tour of Australasia Norman Von Nida Order of Merit title, his finish was bitter sweet. “It’s a bit of a bonus I guess really, I didn’t really feel in this golf tournament, I was always there or there-abouts if I had a great round, but I didn’t have any great rounds really until the Sunday so I think it was a bit a bonus that I got that far,” said Ogilvy. Despite the disappointment in his own finish, Ogilvy was full of praise for Senior. At the 18th green presentation the inaugural OneAsia Order of Merit trophy was also awarded to China’s number 1 player Liang Wenchong who finished equal 12th in this week’s event co-sanctioned by OneAsia and the PGA Tour of Australasia. The Australian PGA Championship was the final tournament on both the PGA Tour of Australasia and OneAsia, with players competing for a total prize pool of AUD$1,500,000.